Shopping for yourself or a friend? There’s a phrase I tend to drop in many of my articles about craft beer in L.A.: “available at better bottle shops around town.” But what exactly does that mean? Ultimately, whether you’re new to craft beer or a pro, you’re looking for a bottle shop with a knowledgeable staff that’s comfortable talking about beer and offering suggestions. Other things to note are refrigerated storage and no visible dust on bottles (faster rotation means fresher beer). You can always pop into booze-focused chain like Total Wine & More or a BevMo! location to find some stellar selections, but here, I present some of my most favorite spots (in alphabetical order) for stocking up on suds, whether as a gift for myself or for a thirsty friend. Any of your favorite bottle shops get left out? Leave a note in the comments. 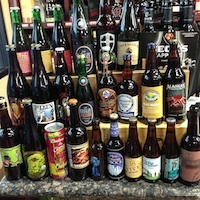 55 Degree Wine | This specialty wine and beer shop has a nice selection of craft beers to go as well as several on tap that can be enjoyed on site. Bonus points for being conveniently located right next door to craft beer/sausage emporium Link N Hops. » 3111 Glendale Blvd., Atwater Village, 323-662-5556. Beverage Warehouse | This place is impressive, if only in its size. What it may lack in organization and refrigeration, it makes up for in selection and value. » 4935 McConnell Avenue #21, Marina del Rey, 310-306-2822. Bill’s Liquor Store | This gem, tucked away in Atwater, is easy to pass up. (Hat tip to my friend John Verive at BeerOfTomorrow.com for recommending it!) Besides having a well curated selection, there’s also a large selection of single bottles available for making your own mix-and-match six pack. » 3150 Glendale Blvd., Atwater Village, 323-663-0684. Buzz Wine & Beer | Over 200 bottled beers are available at Buzz in the heart of downtown, with several more on tap available for flights and tasting. Open nightly until 2 a.m. and conveniently located mere blocks from the Pershing Square Metro station. » 460 S. Spring St., Downtown, 213-622-2222. Cap N’ Cork Junior Market | While unsuspecting from the outside, Cap N’ Cork boasts a wide variety of craft beers, including a good selection of harder-to-find releases. (Impressive whiskey selection as well!) A little on the pricey side, but not by much. » 1674 Hillhurst Ave., Los Feliz, 323-665-7880. Craft Beer Kings — Plaza Market | This well-kept secret in El Monte isn’t just great to visit in person, they’ve also got one hell of an online storefront where you can buy and ship all kinds of rare craft beers, all with a few simple clicks. If you plan on hitting the brick-and-mortar proper, check out Federal Brewing, a new brewery which opened up in October 2013, just two miles away. » 2400 Peck Rd., El Monte, 626-444-4454. Galco’s Old World Grocery | Known mainly for its selection of old timey sodas, Galco’s is a veritable treasure trove of special craft beer releases. The staff’s beer knowledge leaves a little to be desired, but given the fun atmosphere and experience, it won’t even trouble you in the slightest. » 5702 York Blvd., Highland Park, 323-255-7115. Green Jug Fine Wine & Spirits | The only thing more impressive than their beer selection is the fact that just about all of it is stored refrigerated! Service is always friendly and helpful, and while they move through their inventory fairly quickly, since they’re a bit on the outskirts of town, you’ve got a good chance of finding special releases that may have already flown off the shelves at more centrally located bottle shops. » 6307 Platt Ave., Woodland Hills, 818-887-9463. K&L Wine Merchants | While the selection at K&L isn’t as vast as some of the other shops listed here, what they do have is well curated. Staff is better trained for wine and spirits inquiries, but it seems like their craft beer focus is increasing each time I visit. » 1400 Vine St., Hollywood, 323-464-9463. Lone Hill Liquor | Big variety at this Glendora bottle shop, with nearly all of it kept refrigerated. Pro tip: ask Stan if he’s got anything special hiding in the back. » 1828 E. Route 66, Glendora, 626-963-0611. Ramirez Liquor, Wine, and Kegs | Those in the know have enjoyed the array of choices at the Boyle Heights outpost of Ramirez Liquor for years, but the newer Pico Rivera location is an excellent addition to the family-run business. Refrigeration and organization leave a little to be desired, but “grey market” treats that aren’t normally sold in SoCal occasionally pop up among the large selection, which undoubtedly keeps white-whale-seeking beer geeks coming back regularly. (Awesome tequila choices too!) » 736 Soto St., Boyle Heights, 323-261-2915; 9419 Slauson Ave., Pico Rivera, 562-222-2337. Red Carpet Wine & Liquor | This Glendale standby has long been a favorite of mine, boasting an excellent selection of refrigerated craft beer that can be enjoyed on or off the premises. Inventory may be lower than usual through the New Year, since they’re planning a move to 204 N. 1st Ave., Arcadia, in early 2014. » 400 E. Glenoaks Blvd., Glendale, 800-339-0609. Select Beer Store | Torrance-based Monkish Brewing makes a special house beer called “Select Monk”—a Belgian-style ale fermented with saison yeast and Sorachi Ace hops—exclusively for this South Bay craft beer mecca. With more than 500 bottled beers available and a rotating selection of 12 to try on tap while you shop, it’s little surprise why the LA Weekly recently named Select Beer Store as its best store for beer lovers this year. » 1613 S. Pacific Coast Hwy., Redondo Beach, 310-540-1221. Stearns Liquor | The folks here know their stuff and they always deliver great customer service. Knowledgeable, friendly, and willing to take the time to help you find exactly what you need. Great prices and selection to boot. If Stearns was within walking distance of Beachwood BBQ & Brewing, my wallet would be in serious trouble. » 4360 E. Stearns St., Long Beach, 562-597-3984. Stuffed Sandwich | If you’ve never been, read this first. Stuffed Sandwich is not your usual beer-selling establishment. You want to get a pint of something on tap or crack one of their bottles on-site? You’ll need to order some food to go with it. (As in, seriously, they can’t sell you a beer to drink unless you order food, too.) And unless you bring in or buy a nice glass, you’ll be drinking out of a disposable cup. But we all keep coming back because Stuffed Sandwich is an institution that’s been open since 1976 (in its current location since 2003) and as such, they have a one-of-a-kind selection of vintage/rare bottles and glassware you simply won’t find elsewhere, including many larger format bottles (1.5 liter, 3 liter, etc.) that can be enjoyed there or purchased to go. Calling ahead is recommended as co-owners Sam and Marlene Samaniego occasionally need to close the store to tend for Sam’s doctor visits and things of that nature. » 1145 E. Las Tunas Dr., San Gabriel, 626-285-9161. Sunset Beer Co. | I’m still licking my wounds from a recent spending spree here, but that’s no fault of theirs! The prices are very reasonable at Sunset Beer Co., I simply bought too many good things, including some delicious high-end hard ciders that I haven’t seen anywhere else around town. In addition to a well-rounded lineup of beers to go, a comfortable lounge area allows patrons to enjoy any bottles from the shelves or sip any of several beers on tap while on site. Corkage is $2 per bottle if you open it there, but they’ll waive that fee Monday through Thursday from 4 to 8 p.m. Sunset Beer Co.’s proximity to Dodger Stadium also makes it a popular place to hang out and have a little pregame before beginning the steep walk up to the top of Chavez Ravine. » 1498 W. Sunset Blvd., Echo Park, 213-481-BEER (2337). Valley Beverage Company | This corner store on Ventura Blvd. continues to blow me away with its seemingly ever-growing inventory of some of my favorite beers. You won’t find Mammoth Brewing Co. beers around L.A. very often, but when I pine for a bottle of their dank, resiny IPA 395, I know to call Valley Beverage first; the staff there often drives cases of beer back from Mammoth personally! » 14901 Ventura Blvd., Sherman Oaks, 818-981-1566. Vendome Wine & Spirits | Several Vendome and Petit Vendome locations dot the SoCal landscape, but these three tend to have the strongest beer selection of the bunch. There’s a good amount of beer under refrigeration, but there are still some instances where beers that really should be kept cold (like super fresh double IPAs) are found on room-temperature shelves. Staff is generally knowledgeable and enthusiastic to help. » 9153 W. Olympic Blvd., Beverly Hills, 310-276-9463; 11555 Ventura Blvd., Studio City, 818-766-5272; 10600 Riverside Dr., Toluca Lake, 818-766-9593. Wally’s Wines | I feel like a kid in a candy store whenever I walk into Wally’s and I never leave disappointed. (Or empty-handed!) The large, extensive selection is well organized and can easily be looked through on their website as well. Cheeses, charcuterie, and other specialty provisions are also available for the gourmet in all of us. » 2107 Westwood Blvd., West Los Angeles, 310-475-0606. Walnut Liquorette | Though not much to look at from the outside, the craft beer selection at the back of the store will blow you away. Joe is the man to speak with at Walnut Liquorette (a sister location to Glendora’s Lone Hill Liquor, btw); chances are he’s got some even neater stuff hiding in the back if you know how to ask nicely. » 154 Pierre Rd., Walnut, 909-595-5412. Whole Foods Market | Yes, really. I continue to be impressed with the sheer size of the beer sets at these larger Whole Foods Market locations, each of which also has an in-store tasting area where you can quaff while you shop. For instance, I worked at the Arroyo Pkwy. location from October 2007 to January 2010, during which time we scaled our beer aisle up to accommodate over 350 different beers, and it’s more than doubled in size since then! » 760 S. Sepulveda Blvd., El Segundo, 310-333-1900; 465 S. Arroyo Pkwy., Pasadena, 626-204-2266; 18700 Ventura Blvd., Tarzana, 818-578-7840; 225 Lincoln Blvd., Venice, 310-566-9480.